This entry was posted in 6. 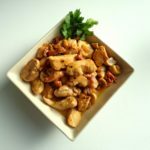 Poultry and tagged bacon, bonne femme, chicken, mushrooms, recette, recipe. Bookmark the permalink. Might it be even more delicious with onions and garlic? Hi David. Yes, you could add garlic. And there are already onions in the recipe!